I went to my doctor on Monday with complaints of knee pain. He sent me home with anti-inflammatory medication and with advice to lose weight. He said the extra pounds that surreptitiously crept at me this past year are placing undue pressure on my lower extremities and most probably caused my sprained knee. So, yeah. The yema balls I’ve been popping into my mouth one every minute this last hour and half are definitely not helping my cause. Made purely of sugar, eggs and condensed milk, yeah, these sweet nuggets are just plain sinful. Woe to my expanding girth and overburdened feet. 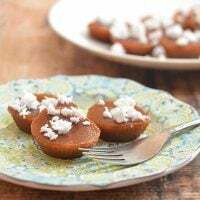 Imagine luscious custard centers and melt-in-your mouth caramel shells, how can I resist? In a bowl, combine egg yolks, condensed milk and lime zest. Stir together until well-blended. In a non-stick pan over low heat, transfer egg and milk mixture. Cook, stirring regularly, until thick enough to form shape. Continuously scrape bottom and sides of pan to prevent burning. Remove from heat and allow to cool. Shape into 1-inch balls. In a thick-bottomed pan over medium heat, add sugar and level evenly. 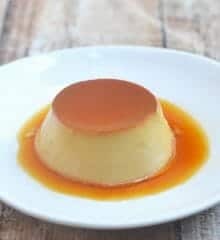 Repeatedly move pan over flames and gently swirl to prevent sugar from burning on spots and to distribute melting liquid. Continue to cook until sugar liquefies and caramelizes. 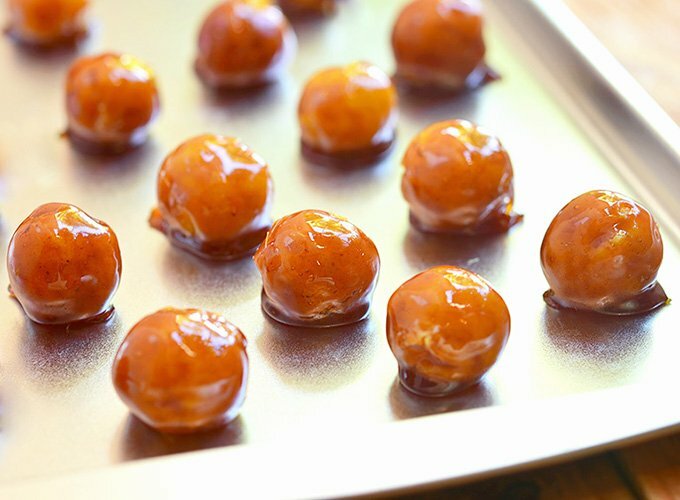 When sugar has turned to caramel, drop custard ball one by one and turn gently to coat. 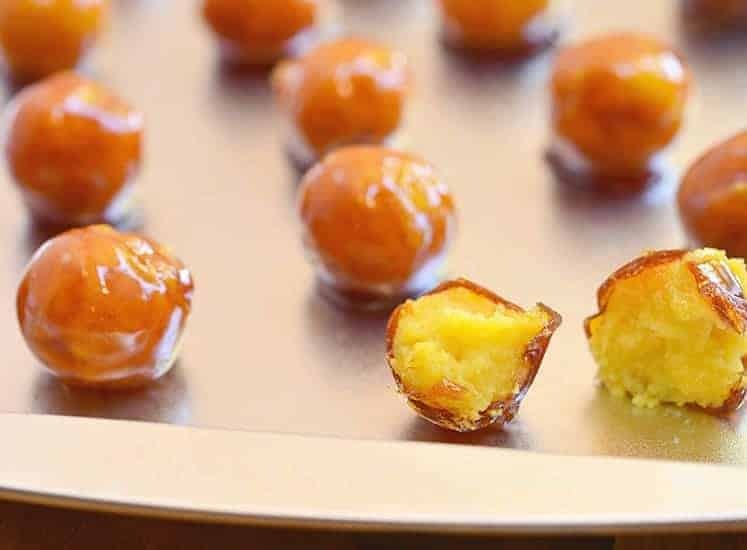 With a fork (this will allow excess caramel to drip off), immediately remove coated yema and place in a single layer on an aluminum pan or any non-stick baking sheet. Allow to cool and wrap individually in cellophane. High Quality Caramel Wrappers 800-1000 Cnt. 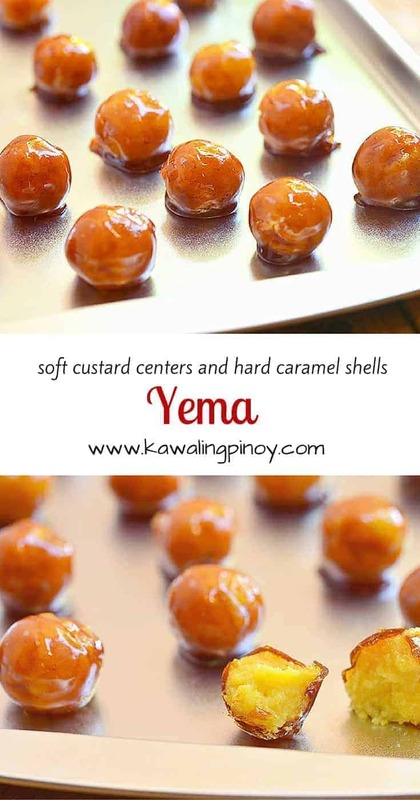 I made yema candy for a party at home. 30 minutes na hindi pa sticky yung yema. I used 2 cans of condense milk and 5 egg yokes. May kulang ba or sobra? Thanks for your response. Unfortunately, your ingredients are way off. The recipe calls for 10 egg yolks for 1 can (14 ounces) of condensensed milk so if you’re using 2 cans, it should have been 20 egg yolks. 5 yolks is not enough to adequately thicken the mixture to the right consistency. You might be able to salvage the mixture by adding more yolks. Temper the yolks first by adding a small amount of the milk in a bowl and mixing thoroughly before adding the yolks to the pan. Hi Ms.lalaine! I’m very much thankful for all of your recipes esp the baked goods! 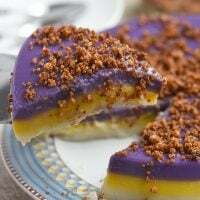 Would you also mind making yema cake please??? 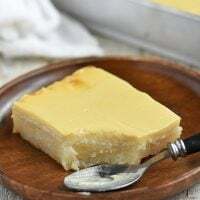 Yema cake will be my next baking project 🙂 Thanks for the feedback, I really appreciate it. 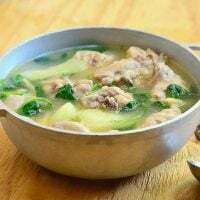 tanong ko lang, yong recipe na nakuha ko kapareho ng sayo….noong niluto ko kasi parang ang lapot na nya kaya hinago ko na at pinalamig. Tapos I formed into ball using small ice cream scoop., nagform naman medyo sticky lang so ni roll ko muna sa sugar bago ko binilog…my question is sticky ba talaga? or kulang pa ako sa halo…. Thank you for this recipe and just to speak my mind, I like the font you are using on your blog. It brings the personal touch instead of boring everyday newsprint. People don’t realize that although something may be different and cause your mind a little harder, it is the variety that helps keep the mind bright and crisp. Hi Ms. Elaine. Just want to ask how many days will the yema lasts?Thanks and more power! Yema don’t last long in my house but 3 to 4 days in the refrigerator would be a good bet. I wouldn’t keep them longer than 1 week as they are made of eggs, just to be on the safe side. First time ko itry iluto tong yema medyo sablay pa kasi medyo malambot akala ko nga hndi mauubos kasi medyo hindi perfect like nung nsa picture 🙂 Itatanung ko pa po sana kung ilang oras o araw po ba ang yema bago masira kasi bka wla kumain, pero nung sinerve ko na saglit lang pala sa mga friends ko haha hindi pla ttgal ng oras. . Thanks for this idea Miss Lalaine. Atleast medyo marunong na ako magluto. Haha, di ba nila pinatawad? Your writing has an easy and fun style, making it an enjoyable read, ever considering writing a book? Is there any chance you might consider changing the font type of your text? I realize your current choice sort of gives it a unique feminine character, as differentiated from other food blogs/sites, but I speak only for myself when I say that it’s at times difficult to read. Maybe something more conventional like ARIAL? On the positive side, I love the fact that you feature some traditional recipes like longganisa,etc. 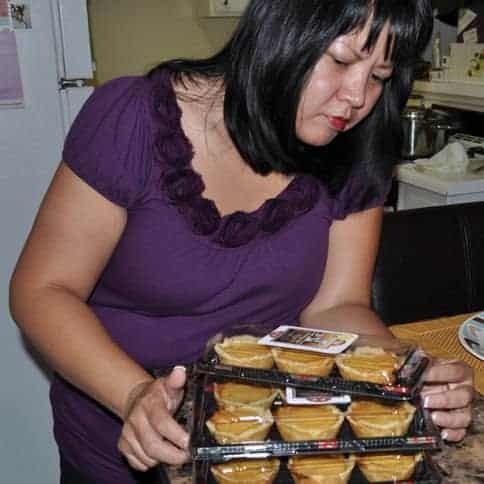 I am presuming you are in the US, and the need definitely exists for Pinays like you and me, to try and keep the cooking traditions alive and available as turorials for the succeeding generations, who having been born and grown up here, hopefully will have the desire to learn more of their parents’ culture, through its cuisine, for example. Thank you and kudos to you! I’ve had comments even before about how difficult the font is to read. I chose the font because I thought it will give the blog a unique touch, kind of like handwritten notes on recipe cards or cookbooks. To be honest, I don’t know how to change it. I have to consult my website designer and have her do the changes. Yes, I am in the U.S. I live in California. It’s been a lot easier to recreate my Filipino favorites at home now as most ingredients indigenous to us are now more accessible than when I migrated back in the 1990’s.